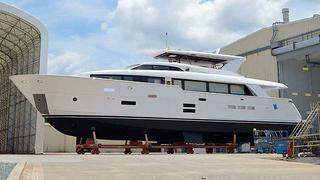 Revealed to the public in February 2012 under the name 95 RPH, the new Hatteras 100 RPH (raised pilothouse) motor yacht is approaching her completion. The American builder has recently published shared some pictures of the yacht entering and leaving the painting shed (see above). As reminder, this 30.48m composite motor yacht has modern lines, designed by the in-house team, and offers generous interior volume and spacious outside areas with a large sun deck covered by a hardtop. The standard interior layout will accommodate eight guests in a full-beam master, a VIP and two twin cabins on the lower deck. There is also an option to create a fifth cabin – or master suite – on the main deck in place of the large American-style galley. Twin 1,900hp Caterpillar C-32 engines will power the first hull, giving a top speed of 25 knots, a cruising speed of 19 knots and a range of 680 natical miles. A ‘muscle’ version with twin 2,600hp MTU 16V 2000 engines is also available allowing a top speed of 29 knots. We undertand that the first Hatteras 100 RPH is now technically launched. The new Hatteras' flagship will make her debut at the upcoming Fort Lauderdale Boat Show.